Van Raam's Easy Sport tricycle is an ideal tricycle for sports minded people who also appreciate comfort. Van Raam's Easy Sport tricycle is an ideal tricycle for sports minded people who also appreciate comfort. This recumbent trike can be used for both sporting and recreational cycling. The ergonomic seating, with adjustable seat height and seat angle, provides optimal support. The frame suspension provides extra comfort. 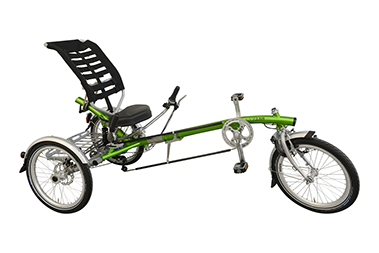 Combined with the variable length setting of the frame and a choice of options, it is possible to suit the recumbent Easy Sport to everyone's wishes. With an optional electrical engine that provides power assistance, the Easy Sport tricycle is an ideal, modern designed tricycle.